The past two years, my son has been a Beaver. For the unaware, Beavers are essentially Boy Scouts between the ages of 5 and 7. Although still eligible to be a Beaver, my boy has decided to move on and do indoor soccer instead. For the first time since 2006, I didn't have a kid in Scouts Canada. That's where my daughter comes in. She's joined Beavers, and last night we had a blast by the Humber River roasting marshmallows over the bonfire. Yes, girls can be Beavers. I was a Beaver, and we never had a single girl in the program. The past two years I've been involved with my son's lodge there wasn't a single girl, either. My daughter is breaking new ground here, and I couldn't be prouder. 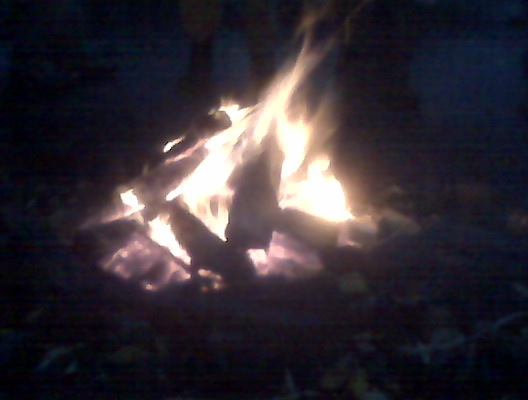 Here's a crappy picture of our fire last night, taken with my crappy Blackberry camera. We have a few girls in our Beaver program & Ventures too. What happens when she reaches the Boy Scouts level? I've wrestled with this subject, and I'm not sure I like that girls are involved with Scouts. I mean - I'm all for equality, but I remember Beavers, Cubs, and Scouts for being somewhere where boys could be boys. It was generally accepted by parents that there were Brownies for girls and Beavers for boys. Why the change? Is there a double standard that sees boys unable to join Brownies if they really wanted to? Yes, there is a double standard. Girl Guides are exclusively for girls. Her other Scouring option is something called Sparks. I hear what you're saying about boys being boys and all that, but I want my daughter to camp and play floor hockey and go on hikes. She's so damn girly! And I heard the big Sparks thing was to spend the night in the Ontario Science Centre. That's cool, but that's not camping. I've seen the Beaver program in action the past two years, and it will be good for my daughter. After Beavers, I doubt she'd go into Cubs... but we'll cross that path in three years. Yeah Michelle. You go camping girl! I am for equality but I think that sometimes there should be things are kept seperate. We have gyms that are exclusive to women and as mentioned above, Girl Guides. I think the issue that brings Mike's daughter to Beavers is that the programs are too one dimensional and don't allow girls to try "boy" things. So good on her for doing and if she enjoys it that is all the better. Don't blame the Beavers for accepting girls, blame the other programs for their lack of diversity of activities. Doesn't the girl scouts program have camping and stuff too? A five year old, like my daughter, is eligible for both Sparks and Beavers. Sparks, at least in my neck of the woods, don't camp. Beavers camp. No matter the debate, I'm very happy to see your daughter enjoying herself in the Beavers. :) As a girl who "flunked" out of the Girl Scouts because a terrible lack of domestic flair, I seriously appreciate parents willing to let their child go with the directions that suit them. Bravo! I truly hope the program is all you both hope it to be!